"41MR12, Burial II, 102" by Timothy K. Perttula and Robert Z. Selden Jr.
DECORATION: Four sets of large engraved circles divided by two semi-circular vertical engraved lines on either side of the large circles. Each circle is composed of eight lines. 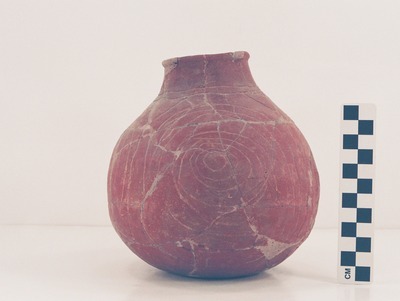 Engraved and red-slipped bottle or olla from Burial II at the Ben McKinney site.